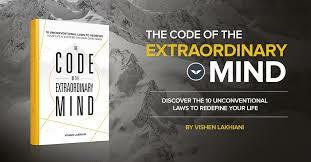 ‘The Code of The Extraordinary Mind’ is an incredible book which in nutshell gives you step by step guidance for achieving success in life, which author has derived based on lives of the world’s most successful people he interviewed 200+ hours. The author, Vishen Lakhiani, is the Founder and CEO of Mindvalley, a 200-person-strong company specializing in learning experience design and the digital education revolution. Lakhiani found that the human brain, like computer software, can be hacked. These laws were assimilated from his personal experiences, as well as insights from successful people like Elon Musk, Richard Branson, and Arianna Huffington. “I firmly believe that we can bring health on this planet for the planet and the humans on it if we started educating the whole person with all their fundamental potentials and capacities and skills and stopped this fragmented, partial, broken system that we have now.”- Ken Wilber academic writer to Vishen. “I used to wake up and the first thing I would do check my smartphone. Now I don’t do that. And just taking this time- sometimes it can be literally a minute to just looking ahead at my day and fill myself with gratitude for the blessings in life and set my intention for the day- it immediately takes away the urgency that we bring into our lives that create such unnecessary stress.” Arianna Huffington, founder of The Huffington Post sharing with Vishen. “Extraordinary minds are able to bend reality. They have bold and exciting visions for the future, yet their happiness is not tied to these visions. They are happy in the now. This balance allows them to move towards their visions at a much faster rate while having a lot of fun along the way. To outsiders, they seem “lucky”. “It turns out that our brains are literally hardwired to perform at their best not when they are negative or even neutral, but when they are positive. Yet in today’s world, we ironically sacrifice happiness for success only to lower our brain’s success rates.